In today’s movie theaters, we don slightly ridiculous glasses and watch everything from piranhas to spaceships spring from the screen. While the technology is new, the impulse to create such virtual realities dates back to long before the advent of 3D cinema. 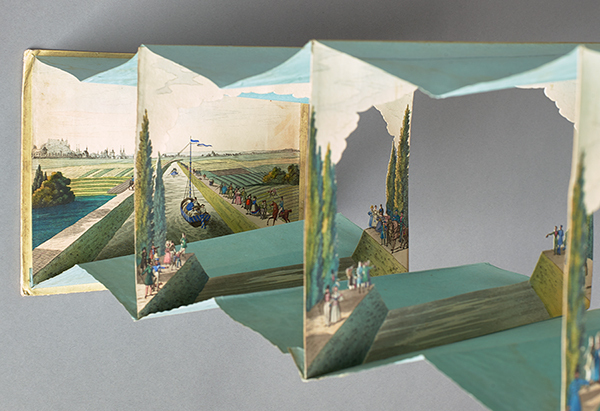 A rare paper diorama from mid-19th-century Germany offers a peek into the innovative arts and engineering that dazzled people in another era. The paper peep show is part of the Getty Research Institute’s special collections and has recently been photographed in detail, allowing contemporary viewers to marvel at this low-tech wonder from the past. 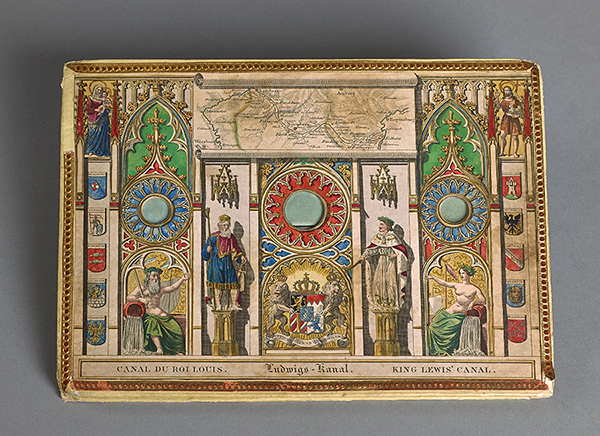 The Diorama of King Ludwig’s Canal is a perspective theater (also known as peepshow or diorama) composed of seven hand-colored prints connected by an accordion-like structure. 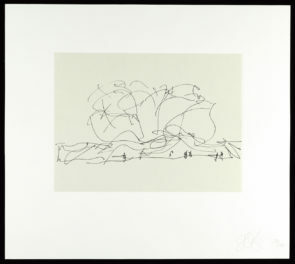 When expanded, the overlapping prints create a sense of depth and produce a window into a miniature, three-dimensional realm. The print on the front board features the façade of a Gothic cathedral, with three rose windows for you to peek through. The print located at the far back acts as a backdrop to the entire scene, while the prints in between add perspectival layers to create the complete view. A map located at the top of the cathedral etching hints at the scene located within: a view of a colorful and exquisitely rendered canal. The diorama was created to commemorate the construction of a canal linking the Danube River at Kelheim with the Main River at Bamberg in Germany. King Ludwig I of Bavaria, known for his support of the arts, commissioned the project and gave it his name. Baron Heinrich von Pechmann designed the king’s canal, which was built from 1836 to 1846. 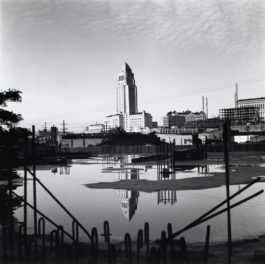 The canal represented a contemporary feat of technology and engineering, but it was soon superseded by the economic and transportation efficiencies of the railway. It was abandoned after sustaining damages in World War II and now languishes in a state of disrepair. The diorama in the Research Institute’s collection is a lasting reminder of the pomp and splendor that accompanied the waterway’s creation. How did peep shows such as this one come into vogue? Perspective boxes were originally the domain of artists and scientists experimenting with the manipulation of space and perspective. The devices later became a form of home entertainment for an elite upper class. During the 19th century, peep shows became popular as souvenirs to commemorate special events and monuments. 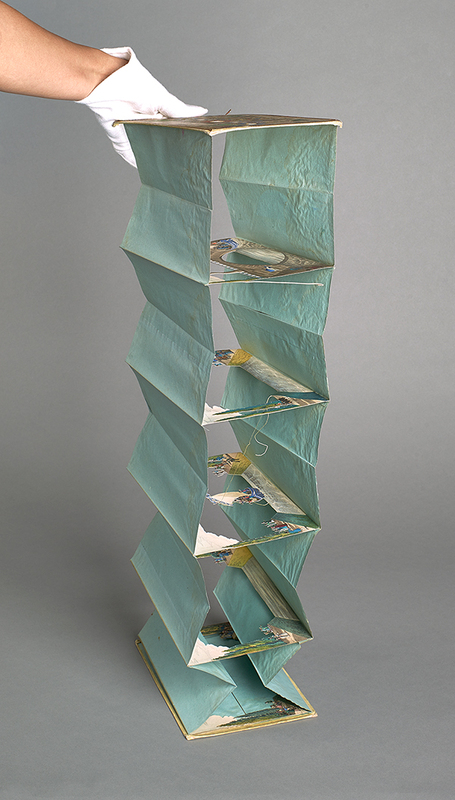 As with the Diorama of King Ludwig’s Canal, people could take tours of spectacular sights with the aid of these paper constructions. As peep shows transitioned from an intellectual pursuit to objects of popular entertainment, they were derided for their mass appeal: in 1719 the art historian Arnold Houbraken stated, “Only rubbish is made nowadays in that genre.” A century and a half later, this lovely perspective theater feeds our fascination with places and times past. Only time will tell if the pop culture 3D movies of today will follow a similar trajectory and become sources of historical curiosity tomorrow. For more on this topic, see Peepshows: A Visual History by Richard Balzer (New York: Harry N. Abrams, 1998). 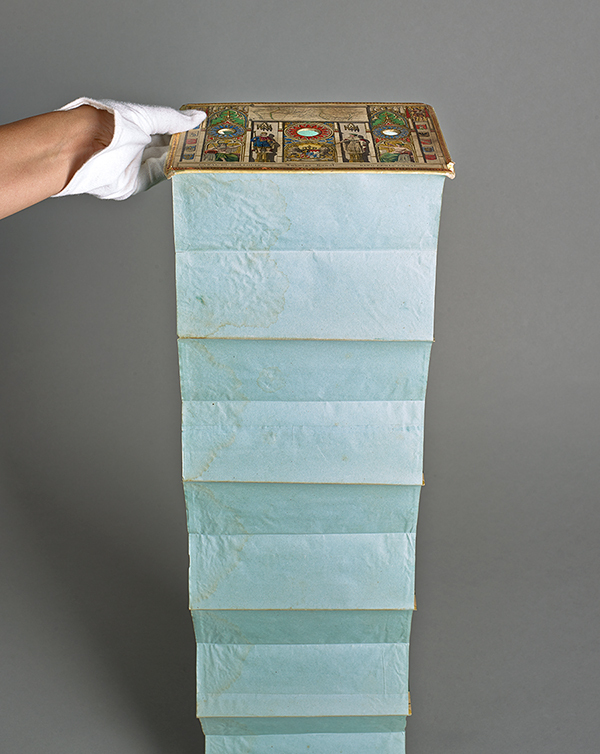 This paper work engineered some time ago is fascinating and beautiful. Paper Peep Shows remind me of some paintings (I apologise for not being able to identify either a painter or painting) where one is expected to view it from a specific angle for the subject to reveal itself; any other angle simply provides a painting of either something banal, or a painting that makes little sense. I would be thrilled if someone at your end could help me with two related questions: provide me with the names of some paintings and painters who fall into this genre; please inform me of any publishing house interested in reproducing such items. A German artist, Lothar Meggendorfer, did some fascinating work during the late 1800s and the early 1900s with some brilliant pop up books and folders and also designed books with characters who could move thought the use of a tab and tiny metal rivets. 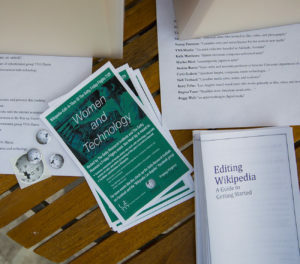 The originals are very costly but a German Publishing House, Esslinger, has begun to reproduce some of these books introducing thousands of new readers and players to this paper engineer of the past. I hope I have not intruded or taken too much time by asking these questions. I eagerly await your responses.